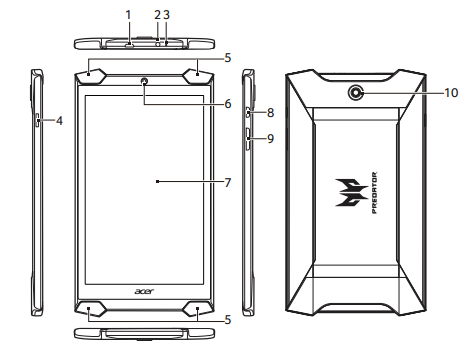 The Acer Predator 8 user manual is available in english language. It's consist of 55 pages. In this manual provide detail reference information such as learn tablet layout with key features on page 4, Turning on for the first time, Sign in to or create a Google account, tutorial Assembling the power adapter, Using the touchscreen, Changing the Home screen wallpaper, Changing Google keyboard settings on page 19. Then about tutorial Inserting a microSD card on page 22, Connecting to a PC as a USB storage device, Connecting a Bluetooth device, Managing Wi-Fi connections, Setting up the Email application, using playstore, using multimedia playback, using camera and camcoder on page 34, tutorial shooting video, Virtual Private Network (VPN) settings, Updating your tablet’s operating system, backup, Resetting guide. Why is there no sound coming from the device? Why do I have less storage than the specifications say? Why can’t I view my picture files? Why can’t I view my video files? Why can’t I play my music files? How do I check the OS version of my device? Where can I find my serial number ID (SNID)? How do I check memory status? What do I do when my device’s internal storage is full or almost full?